TinyMe was a Unity Linux-based mini-distribution. It exists to ease installation of Unity Linux on older computers, to provide a minimal installation for developers, and to deliver a fast Linux installation for where only the bare essentials are needed. Rate this project James Cameron has announced the release of OLPC OS 13.2.10, an updated build of the project's specialist distribution developed under the initiative of the One Laptop Per Child (OLPC) project to provide children in developing countries with low-cost laptops. This version, still based on Fedora 18, is mostly a bug-fix release with updated "activities": "We're pleased to announce the release of OLPC OS 13.2.10 for XO-1, XO-1.5, XO-1.75 and XO-4. It is Sugar 0.112 on Fedora 18, with updated activities Clock-20, GetBooks-18.1, ImageViewer-64, Implode-19, Jukebox-34, Log-39, Maze-28, Memorize-55, Paint-68, Physics-34, Pippy-72, Record-103, StopWatch-20.1, Terminal-45.4, TurtleBlocks-218 and Write-99.1. Fixes: activity journal title - save on enter, clear selection and close toolbar on enter; fix Gtk.SpinButton styling; update the favourite icon when there is only one journal object; fix copy-from-journal utility - undefined name error, DBusGMainLoop; fix for activities that do not properly stop; increase icon LRU cache sizes; new translations. Clock-20: ticking clock and accurate second hand; improve documentation; simplify time translation; declare license metadata, GPLv3+ and Public Domain; update POT file...." Here is the brief release announcement, with much more details provided in the release notes. Download: 32022o0.img (751MB, MD5, pkglist). James Cameron has announced the release of OLPC OS 13.2.8, the latest version of a specialist distribution developed under the initiative of the One Laptop Per Child (OLPC) project to provide children in developing countries with low-cost laptops. 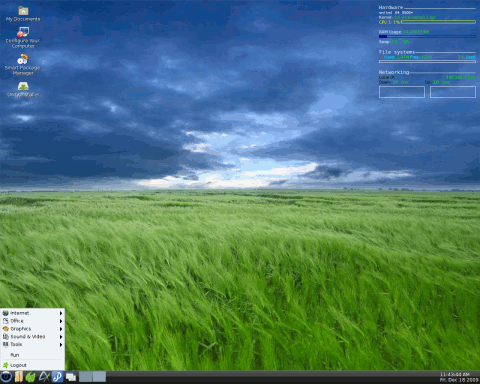 This release is still based on Fedora 18, but it ships with updated Sugar, the distribution's default desktop user interface: "We're pleased to announce the release of OLPC OS 13.2.8 for XO-1, XO-1.5, XO-1.75 and XO-4. Features: new Sugar 0.110 with completed translations; updated activities Speak 52, Measure 53, Maze 26.1, Implode 17, GetBooks 16.2, Clock 18.1 and Chat 83; add sugar-erase-bundle feature, for use by deployment scripts. Fixes: fix Fedora secondary mirror references so yum can work; remove Sugar Web Account control panel as it does nothing; remove Simple-English-Wikipedia on XO-1.5 to fit into 2 GB limit for some models; add forward and back buttons in help view; display activity instance title in join requests...." Read the release announcement and release notes for further details and installation instructions. Download: 32020o0.img (745MB, MD5, pkglist). Daniel Drake has announced the release of OLPC OS 13.2.0, a Fedora-based Linux distribution developed under the initiative of the One Laptop Per Child (OLPC) project to provide children in developing countries with low-cost laptops: "We're pleased to announce the release of OLPC OS 13.2.0 for XO-1, XO-1.5, XO-1.75 and XO-4. OLPC OS 13.2.0 is a new software release focusing on cleaning up a few edges from our previous release, and finishing off support for the new XO-4 laptop. Features: XO-4 power management is now stable and enabled by default; Bluetooth support as a purchase option; in the Clock activity, you can now use the touchscreen to drag the clock hands to another time, a useful exercise for learning about time; drop-down lists are sub-optimal for touch, they have been replaced by more intuitive and touch-friendly UI elements in Record; the pinch-to-zoom touch gestures in Image Viewer behave much better than before...." Read the release announcement and release notes for more details. Download: 32013o0.img (721MB, MD5). Daniel Drake has announced the release of OLPC OS 12.1.0, a Linux distribution created under the initiative of the One Laptop Per Child (OLPC) project to provide children in developing countries with low-cost laptops: "We're pleased to announce the release of OLPC OS 12.1.0 for XO-1, XO-1.5 and XO-1.75. OLPC OS 12.1.0 is a new software release focusing on improving the XO-1.75 user experience, and undertaking a much-needed technological shift for Sugar's internals to GTK+ 3.x. Additionally, XO-1.5 and XO-1 continue to be supported in this release, and we include a variety of new features and fixes. Features: Sugar 0.96; transition of Sugar components to GTK+ 3; write to the journal any time; a new icon in the Sugar frame allows for any currently-selected text to be dictated by the internal speech engine; Browse, Wikipedia and Help have been moved from Mozilla to WebKit internally...." See the release announcement and release notes for further information. Download: 21021o0.img (656MB, MD5). Daniel Drake has announced the release of OLPC OS 11.3.0, a specialist distribution created under the initiative of the One Laptop Per Child (OLPC) project to provide children in developing countries with low-cost laptops: "We are pleased to announce the release of OLPC OS 11.3.0. This new OLPC software release adds several new features and significant bug fixes. XO-1 and XO-1.5 are fully supported as usual; additionally, this release adds support for the new XO-1.75 laptop. Sugar 0.94 is included in the release; this updated version includes various improvements such as more powerful View Source functionality, and easier file exchange between the Journal and the regular file system. One notable change is that the Keep button has been removed from activities. Many users mistook this with Save, but actually Sugar saves all your work for you - you do not have to tell it do so." See the brief release announcement and the detailed release notes for further information. Download the live USB image from here: os883.img (649MB, MD5). XO Software 8.2.0, a Fedora-based distribution designed for the One Laptop Per Child (OLPC) project's XO Laptop, has been released: "Announcing the general availability of XO Software release 8.2.0. Release 8.2 is based on a child-focused graphical interface called Sugar, a Fedora 9 Linux operating system and OLPC customized implementations of core software including power management, wireless drivers, NAND flash file system, Open Firmware, and other components. Major new features: an updated Home view and Journal with new options for finding and organizing activities; an enhanced Frame for collaborating with other XOs and switching between running activities; a graphical Control Panel for setting language, network, and power preferences...." Read the release announcement and release notes for more information and installation instructions. Download: xo-1-olpc-stream-8.2-ext3.img.bz2 (186MB, MD5), jffs2/os767.img (234MB, MD5).